Young or old, boy or girl. Our birthday themed paper is a fit for all birthday occasions. Finished off with a bright yellow bow, it is sure to deliver a smile. Add a special touch to gift items purchased from Paper Concierge! Professional gift wrapping from "Ribbons and Wrapping by Rene" is now available for items purchased from Paper Concierge. For only $12.99 you can wrap any item in one of 8 beautiful designs. 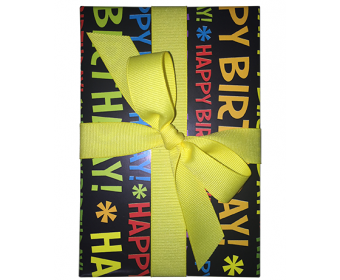 All gifts are wrapped in premium quality paper and bows are hand tied Grosgrain.